On the eve of worldwide delivery to backers and pre-order customers, Mellow is making a re-appearance at ISPO MUNICH, the leading international trade fair for outdoor, performance and action sports, specializing in innovative and discipline-overlapping segments. Founded 45 years ago, ISPO now showcases more than 2,600 international exhibitors to over 80,000 visitors from 110 countries. ISPO takes place this year on 5-8 February 2017, in Messe München fairgrounds. Equipped with the new production series Drives, Remotes and App, the core Mellow team will be on hand to answer questions, discuss performance and tech, and - best of all - give test rides. Of course, there will be swag, lots of Mellow swag. If you've been keeping up with Kickstarter updates, our YouTube channel and appearances on Instagram, Facebook and Reddit, you'll know that we are one of the few Kickstarters whose final product is miles beyond what was originally promised: doubled skateboard motor performance, Gore-tex battery waterproofing, automotive-grade parts, a more protective wrap-around magnesium frame, highest grade flame-retardant battery housing...the list goes on. 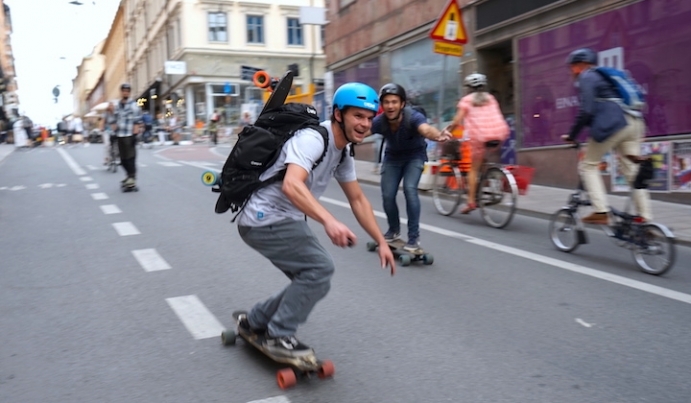 Participation in industry fairs like the US-based Surf Expo and ISPO MUNICH give Mellow greater exposure in the world of high performance sports, letting us widen our reach by showing distributors and retailers first-hand what the Mellow electric longboard & skateboard Drive can do. Although such fairs are open only to sports business professionals, all Mellow riders will benefit as the community grows. We'll be in Hall B6 (Action sports), Booth 334. Come and visit!